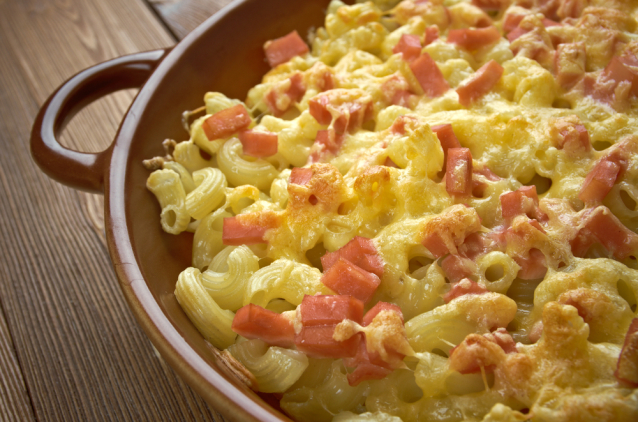 Gratinated pasta casserole known as Šunkofleky are easy, quick and cheap dinner. It tastes best with pickled gherkins. You can use all types of small pasta and improve recipe with cheese or meat of your choice. Meanwhile cube boiled smoked meat or sausage. Mix pasta and meat together in a pan. Put to preheated oven for 15 minutes at 220°C. Whisk eggs and season with salt and pepper. Pour eggs over pasta. Reduce temperature to 180°C and bake for another 10-15 minutes.